When you’re traveling, it’s a good idea to keep a small first-aid kit on hand for unexpected emergencies. There are plenty of ready-made kits available, but here's how to put together your own on the cheap. The following straddles the line between being suitable for a ultra-light packing backpacker and a family holiday. Some things are a bit over the top unless you travel with kids, but this kit should get you out of most first aid situations while traveling. Any prescription medicines in their original bottles, bring twice as much as you'll actually need for your stay. Include original prescription slips if you can and ideally a note from your doctor as well - this will come in really handy if you need to replace your medication at your destination! Records of your vaccinations and any medicine intolerances you may have - this could save your life! Of course, the better you know first aid, the more mileage you'll get out of your kit. In the US, the American Red Cross can give you a first aid course. In the United Kingdom, St. John's Ambulance provides first aid courses. These are well worth the time and expense, you'll be much more confident both while traveling and while at home should someone need assistance. Of course, making your own first aid kit isn't always practical, so here are a couple of suggestions for commercial kits that I've found of great use. 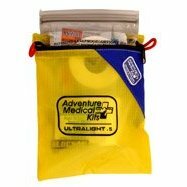 For the minimalist traveler, the Adventure Medical Kits Ultralight & Watertight .5 (3.5oz) from Amazon.com fits the bill. It really is minimalist, and a in-depth knowledge of first aid would be highly valuable if you pack this. 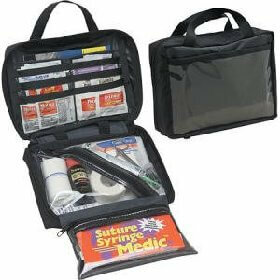 If you have more room, the Adventure Medical World Traveler First Aid Kit from Amazon.com will work better. This is pictured top left and is very comprehensive. This kit should get you out of most situations. It's a little bit on the bulky side, but even a paramedic would feel comfortable bringing this along! If you're in the UK, shop for first aid kits at Amazon.co.uk. Last updated by jack on 22 February, 2008 in Travel Tips.